Pivithuru Hela Urumaya Leader and MP Udaya Gammanpila yesterday challenged the newly appointed Inspector General of Police (IGP) Pujith Jayasundara to arrest Opposition Leader R.Sampanthan to show his impartiality when implementing the law. He was addressing a press conference at the N.M. Perera Centre in Borella. He said Opposition Leader R.Sampanthan along with several TNA MPs and a group of NGO representatives had forcefully entered an Army Camp belonging to the Gajaba Regiment in Palavipachchan in Kilinochchi on April 16. He pointed out the Army had lodged a Police complaint in this regard on the same day. “The IGP speaking to the media after assuming duties said that he was ready to discharge his duties impartially. However, we should judge the IGP not by his words, but by his actions. The above incident is an opportunity for him to show his impartiality. Sampanthan had entered the premises forcefully, disturbed the duty of army personnel and had stated that the army camp should be removed. He had noted those lands should be given back to the Tamil people. So far, the law has not been implemented against him despite the Police complaint lodged. “We challenge the IGP to arrest the Opposition Leader if possible and show that he was true to his words,” he said. 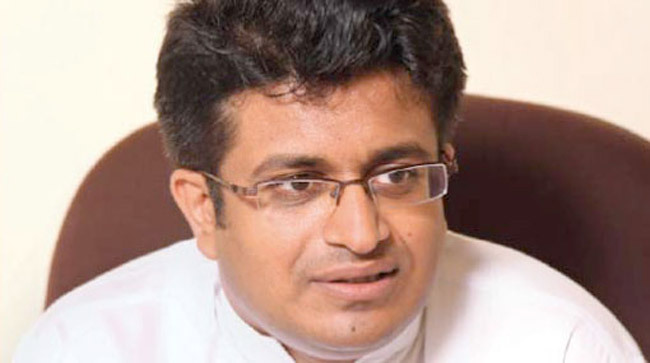 Gammanpila also said that they would make a complaint to the Bribery Commission over a suspicious act of shares trading by the Sri Lanka Insurance Corporation which led to a loss of Rs 146 million to the Corporation. “Sri Lanka Insurance in 2011 bought approximately 33 milllion shares of a fish exporting company at a price between Rs 3.90 and Rs 6.20 per share. However, all these shares were sold by the Corporation at Rs 1.70 per share suddenly on April 18 to an unknown private investor named K.Gajanadan. Four days after this transaction, the EU ban on fish exports was lifted. When the Government was repeatedly saying that it intends to get the EU fish ban lifted very soon, why did Sri Lanka Insurance, being another government owned institution,allegedly sell the shares of a company that exports fish to the EU bearing such a huge loss We go before the Bribery Commission, not because of any faith we have in this Commission, but because it is the only legal body to lodge such complaints,” Gammanpila said.